Martyn Irvine of Aqua Blue Sport is about to launch into serious racing action after his long lay-off. He crashed in Belgium at the end of May, but he’s back in the saddle and ready to go. Martyn Irvine is back into serious racing action after his crash-related absence from the pro peloton in recent months. The former world track champion is part of Aqua Blue Sport’s line-up for the Arctic Race of Norway. A 2.HC ranked event, it gets underway tomorrow and continues for four days. While it is not Irvine’s comeback event, it represents his first foray into serious action since he crashed. He started the RideLondon-Surrey Classic the weekend before last. It was intended to ease him back into action and, unsurprisingly, he was not a finisher there. However, the event in Norway has both sprint stages and climbs. And with four days of action it will be a serious test for Irvine. He is named in the Aqua Blue Sport six-man team alongside fellow Irishman Matt Brammeier. Also in the team are Michael Kreder, Peter Konig, Lars Petter Nordhaug and Calvin Watson. 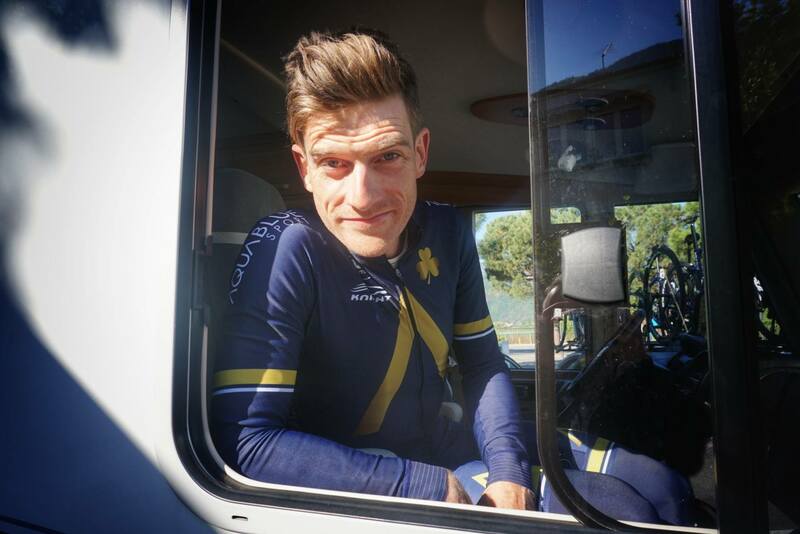 Martyn Irvine came out of retirement late last year to make a comeback once offered a place by Irish ProContinental team Aqua Blue Sport. His return to pro racing was delayed by the requirement to be in the anti-doping structure for six months before racing again. And when he got underway he was just getting into his stride when he crashed in Belgium. He hit the deck hard at the Baloise Belgium Tour during the last week of May. Irvine had been on the attack and been recaptured on the opening stage when he fell victim to a crash in the peloton. He got back up on his bike and made an effort to continue. However, the pain was too much and he was forced to stop. A medical examination at a nearby hospital later diagnosed a fractured hip.